Maureen Flaherty stands with the lithograph she says she purchased at a Goodwill in Bradenton, Fla.
A Florida woman who purchased a $43.50 lithograph print of a dog at a Goodwill store is now auctioning off the painting for charity after learning it could be worth thousands of dollars. Maureen Flaherty, of Summerfield, Florida, was paying for items she purchased at the grand opening of a local Goodwill store on March 19 when a lithograph print of a dog caught her eye. The artwork was priced at $43.50 and Flaherty says she rounded up the total to $44 as a donation to Goodwill. When Flaherty walked out of the store carrying the 39 1/2 by 29 1/2 inch print, she says she was stopped by a local antiques dealer who told her, “You just walked out with the most valuable thing in there." Maureen Flaherty says she purchased this lithograph at a Goodwill in Bradenton, Fla. The dealer, identified by Flaherty as Jess Sturtevant of Braden River Antiques, offered to buy the print from her if she ever wanted to sell it, but Flaherty says she "just loved it" and took it home with her as planned. “Once I was home I thought, 'Let me see why he was so interested in it,'” Flaherty told ABC News. The print, Flaherty learned after doing her own online research, is one titled, “The Brook Hill Dog" by artist Alexander Pope in 1911. Flaherty says the vintage advertising tins such as the one she purchased were distributed by Friedman, Keiler & Co. Distillers to be displayed in bars and saloons. A similar print, Flaherty also learned, had been sold for $3,300 at an auction last winter. With the news that her $44 purchase could be worth a lot more, Flaherty got back in touch with Sturtevant of Braden River Antiques, but told him she did not want to sell the print to him. Instead, she wanted to auction the print for charity. "I foster dogs so I had the idea that since it’s a dog print, let’s auction it off so half the funds will go to a dog fund,” Flaherty said. “The other half is going to go towards a book I’m writing on about fostering dogs." Flaherty says Sturtevant offered to help her auction off the painting as soon as she told him of her intention. Another woman, who had previously adopted a puppy from Flaherty, offered to pay the shipping costs for the sale so that Flaherty could make it a national auction as opposed to local. 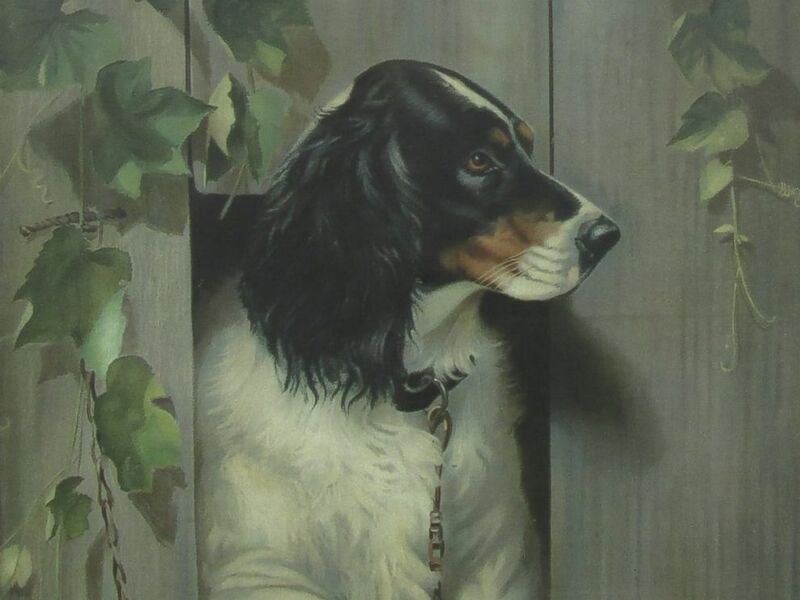 The "Brook Hill Dog” print will be auctioned on eBay from April 3rd to April 10th by Braden River Antiques. Flaherty has designated Safe Haven Animal Rescue, a local animal shelter she works closely with, to receive 50 percent of the proceeds. A spokeswoman for the local Goodwill region confirmed to ABC News that Flaherty did purchase the print from the charity’s new 23,000-square-feet store, and says that it was her luck to spot it in the store. “We teach our pricers to locate certain authors, certain designers but, with that being said, you can still find great items because we’re human and sometimes we miss things,” Kelly Davis Strausbaugh told ABC News. “We have real people doing the pricing so occasionally you’ll find these really great items."